This tool allows to produce and print Tax invoices for clients with Monthly Billing for Services or 3rd Party Billing for Services (as defined in the client card rules). Hyper checks the defined rules of the clients, searches for monthly billing and displays the details of these clients. Bill Until Date Select the latest date for the invoices. The table will display all of the invoices that should be produced until this date. Origin Production Time Select the date for the origin production time of the invoices. The user can select any date up to 14 days before the current day. After filling in the fields at the top of this tab, press the Build Auto Billing Report (F5) button. This action will gather and display the open billings with no tax invoice, that should be charged. Additional information fields at the bottom of this tab, display the total charge of the required records that were marked in the check box of the "Description" field. 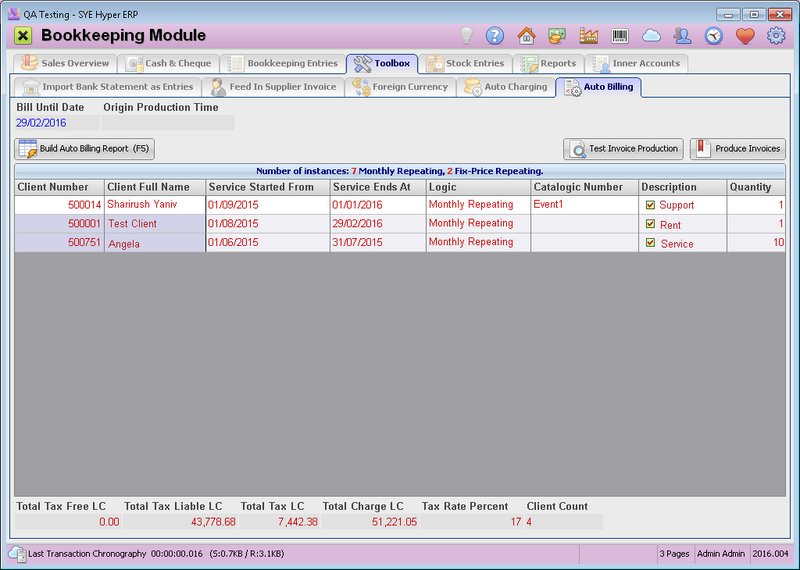 The title of the table presents the number of instances of each type of billing. By using the Test Invoice Production button, the user can open a print preview to verify the details of the tax invoices. Please Note - only the marked records (in the check boxes of the description field) will be displayed and produced. For "Monthly billing for services", the charges will be calculated relatively, according to the amount of days of given service in the month. In order to produce the tax invoices, press the Produce Invoices button. Alternatively and according to the client card definitions ("Send Official Documents to Primary Email" field), the tax invoices will be sent to the client via Email.